While selecting an investment product, we have to consider not only the cash-flow issues but also have to take into account the problem of making proper choice having regard to lock-in period, risk associated with the product and return on investment. For many taxpayers, it may not be possible to invest in a product with longer tenure in view of commitments in the near future. The present provision of the Income Tax Act has tax saving products to meet taxpayers’ diverse needs as regards tenure, security and returns and associated risks. 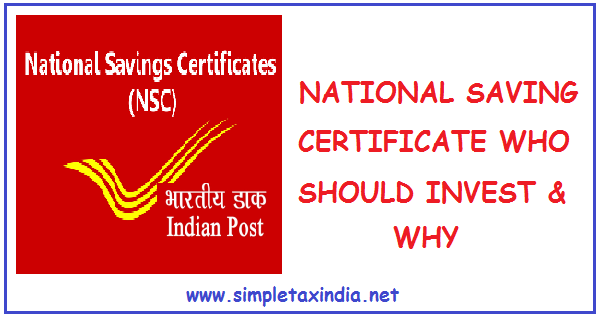 One of the most popular and widely used tax saving instrument for ages has been National Saving Certificates (NSC). In spite of advent of other products like ELSS, NSC has retained its charm for certain sections of the society. Let us discuss the various facets of this special instrument of investment. The investment made in NSC is eligible for deduction under Section 80C of the Income Tax Act, upto Rs. 1.50 lakhs every year, together with other eligible items like Life Insurance Premium, Equity Linked Saving Scheme, Tuition fee for school going children, Provident Fund contribution, PPF contribution, principal repayment of housing loan, five year bank deposits etc. In addition to the initial amount of investment in NSC the accrued interest on these NSC, for all years except the year of maturity, is also eligible for deduction under Section 80C within the overall limit of Rs. 1.50 lakhs. Since the interest on NSC is taxable and at the same time is eligible for deduction under Section 80C, the interest effectively becomes tax free in your hands in case the amount of eligible amount qualifying for Section 80 C does not exceed the ceiling amount. Earlier NSCs were available for two tenure 5years as well as 10 years. The 10 years NSC have very recently been discontinued. The rate of interest on NSC is fixed for the entire tenure of the NSC i.e. for five years and any subsequent revision in the interest rate will not change the interest on NSC already issued, so NSC is a good product in the times like present one when the rate of interest is expected to go down and has constantly been going down. Once you have made the investment, your money is locked at higher return. The rate of interest on NSC is linked to yield on government securities. Earlier, the interest rates of all the small saving schemes were fixed for one year and were made applicable from 1st of April every year. Now the frequency of revision has been modified and the rates are announced and made applicable on quarterly basis. As per the latest announcement, the present rate of interest on NSC is 8.00% and is compounded on yearly basis. Only an individual can invest in NSC. A non resident and an HUF are not allowed to invest in the NSC. The NSC can also be purchased in the name of a minor. The certificates can be held either in individual names or in joint names. These can be held jointly or on survivor basis or on either or survivor basis in case of jointly held NSCs. The NSC can be pledged as security for availing any credit facility with a bank after a prior permission for such pledge is obtained. The NSC can also be encashed before its maturity period under certain circumstances like on death of the holder or on order of a court. The NSC can be transferred from one person to another person under certain circumstances. Likewise the same can be transferred from one post office to another post office if you move from one place to another place. Looking at the various attributes and facilities there are certain class of people for which NSC as investment product is a better choice. Various features like the rate of interest being known in advance, no tax deduction at source and a tenure of only five years make this investment product very apt and suitable for senior citizens who do not have the ability to take any risk at this juncture in the life and cannot get their money blocked for longer tenure products like PPF. Moreover since there is no cap on the amount upto which you can invest in NSC, this make it more attractive for senior citizen as there is a restriction of Rs. 15 lacs upto which you can invest in Senior Citizen Saving Scheme. Since the interest is known in advance and is fixed for the entire tenure this is an excellent product for a person whose ability to take is very low for any reason. Moreover, since you can pledge the NSCs for availing a loan or an overdraft facility this will become attractive for a person who is facing liquidity problem and thus avail tax benefits even without forking out full money. This comes handy to the taxpayers who fall short of investments for availing tax benefits under Section 80C and do not have the sufficient resources to fund the NSC. These people can temporarily arrange the funds to buy the NSC and then avail loan against the NSC and pay off the temporary loan taken. Looking at the anticipation of decline in interest rate in the country and the fact that the interest on NSC gets fixed at the time of purchase itself and thus helps you in locking your returns for next five years even if the interest rates go down substantially during the next five years, whereas the changes in interest rates will impact the accumulated balance in case of Public Provident Fund, another popular investment product eligible for similar tax incentive, it seems logical and advisable to go for NSC whole hog at least for now. However this may work to your disadvantage in the rising interest rate cycle. I am sure with this discussion, you are now in a position to take an informed decision about making your investments in one of the excellent investment products. 10 year nsc Balwant Jain NATIONAL SAVING CERTIFICATE NSC ACCRUED INTEREST nsc.